It has been a long time since I last posted a wishlist post on here, so much so that I had to delve back through my blog archives to see what I used to call this little series. As it stands I am somewhat on a beauty spending ban, in fact I have been for a good while. This is mainly due to the fact that I still have so many products to use up and also that my life has changed and I find myself spending money on other things these days as opposed to make up and skincare. That being said, the beauty junkie within me is still fully present! I cannot wait to pick up a few new things come the summer time. Therefore, until that time I will sit back and collect a list as long as my arm of the things that currently take my fancy; I will then have to narrow that list down considerably come later on in the year. Well if there is anything I should finally pick up it is the Hourglass Ambient Lighting Palette considering it was on my last wish list back in February last year…oh my! Everybody I know who has this raves about it, I own the blush version myself and absolutely adore it so I know that this would be a really nice treat. Naturally as a beauty blogger I am aware of Caroline Hirons and the sheer amount of knowledge that she has put my way, just through reading her blog. I really do think that her no nonsense attitude is incredibly refreshing which is perhaps one of the reasons why I tend to follow her recommendations, so long as the budget will allow. Luckily for most of us, she has collaborated alongside Pixi and has released a cleansing balm duo which I really do hope to pick up later on this year; I am incredibly curious to see how this works for me. The Becca Shimmering Skin Perfector in Champagne Pop has, like the Hourglass Palette, been on my wish list since its launch. Once again I have read so many positive reviews about this product, so much so that out of everything on here this is probably the product that I will purchase without question come the summer time. It’ll be the perfect time to pick it up too as hopefully it’ll go nicely with a bit of tan….perhaps that is wishful thinking, I do live in the UK after all. This is a shade that I have seen Fleur from Fleur de Force rave about several times. I personally haven’t tried it and would never just purchase it online having not swatched it in store, yet next time I do pass a MAC counter I do intend on checking this out. As of yet I haven’t tried any of the new liptensity range so I am also looking forward to seeing what that is like. If you haven’t heard of this lipstick or the corresponding lip liner then quite simply, where have you been my friend? The liner under the same name is incredibly popular and is for me once of the nicest liners I have personally used. The colour is insanely beautiful and it looks so natural on the lips. It is most certainly a product I would really like to purchase this year, although I already have so many lipsticks that it somehow does feel rather unnecessary. To this day I have yet to try a Kiehl’s product that did not work for me. Unfortunately for me this is one of the more expensive products from Kiehl’s that I am aware of so it is unlikely that I will be able to pick it up any time soon. That being said, I am still very much in love with their Tumeric and Cranberry Seed Radiance Mask which is more affordable; I would highly recommend it. Last year I only discovered two fragrances that I honestly liked. The first was YSL Mon Paris which I managed to pick up in the Christmas sales and the second was Hugo Boss The Scent. When I last tried this at the beginning of January I still liked it a lot, therefore it may end up falling onto my birthday list come July. Having said that, my bottle of Bronze Goddess is due for replacement this year so I may just have to pick that up instead; I really do need that in my life. 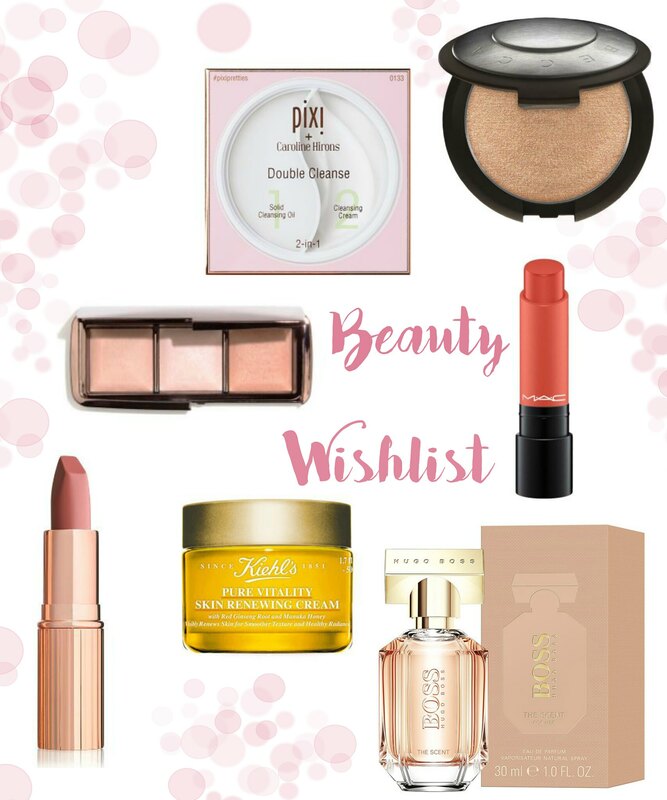 What is on your beauty wishlist?